Most everyone has a bucket list of things they would like to do before they die. I’m no different in that regard. However, most people’s bucket list of things they want to do becomes the bucket list of things they wished they had done and the regrets spill over the top of the bucket the older they get. I don’t want that to happen to me. My bucket list is an odd assortment of different things. Some of which are ordinary, very attainable things. Others seem rather on the impossible side. I’ve even gotten some ideas from looking at other people’s lists that have been posted on the internet and swiped them for myself (visit Joel Runyan’s blog for your own inspiration). Drop down to 25% bodyfat. Be able to do the splits. Learn how to do a back flip. Jog a 10 minute mile. Walk as a steady pace over 4mph. Walk a marathon within the course allowed time (the ones I’ve seen are usually 8 hours). Bike 100 miles in one go. Participate and complete an Ironman triathalon. Go to one of those military style boot camp “vacations”. Climb to the top of Mt. Hood. Climb to the top of Mt. St. Helens. Learn how to hold my breath for 3 1/2 minutes at a time. Learn mixed martial arts & wrestling. Further my kung fu training. Learn how to kite surf. Learn how to speak at least five different languages other than English. Russian, German, Spanish, Japanese and Chinese are tops on the list. Make a quilt for charity auction. Develop my artistic talents. Draw more! Learn how to ride a motorcycle. Drive a Bugatti Veyron at least once. Take voice lessons and learn how to carry a tune. Relearn how to read music (been so long, I don’t remember). Learn how to play musical instruments. Banjo and ukulele are tops on the list. Be an extra in a Hollywood film. Learn how to identify wild edible plants and mushrooms. Learn how to pilot a helicopter. Go for a ride in a hot air balloon. Learn how to train animals. Develop a green thumb (currently my thumb is quite black since I tend to kill plants) and grow a nice garden. Develop better, more solid relationships with my friends. Develop better, more solid relationships with my extended family. Develop better ties with my community. Get an RV so we can spend extended amounts of time roaming the US. Write excellent content for my blog, help & connect with people. Get 5000 hits per month on my blog. Get 10,000 followers or more. Write and sell a feature length script. Write and sell a feature length script that actually gets made into a movie. Write and direct my own feature length film. Write and publish a non-fiction book. Write and publish a fiction book. Start a business (or more than one!) that brings in $1000 a month or more net. Turn business into something that can be automated, so that I can step out of the picture and just be the owner, not the person who does everything! Learn how to trade in commodity futures and options. Learn about how IRA’s and 401K’s work. Determine the best insurance to get for my family for self-employed people. Help Micah get his kidney transplant. Help my daughter through the muck of adolescence and teenage drama the best I can. Be the first person my family thinks to call when they need help or support. Own our very own property somewhere. Build a house with my own two hands. I’m sure this list barely scratches the surface. There are so many things I want to do with my life. I may add more things as time goes on! I can use this list to come up with a plan of action so that I can accomplish these things. Whoever actively plans to do the items on their bucket list? Probably not many. I never did. But I am starting now! 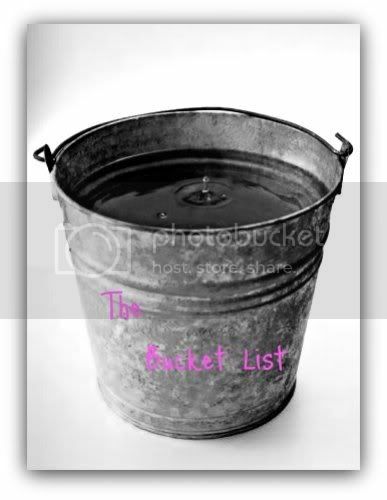 I’m creating a bucket list category for my blog so we can keep track of what I’m doing to fulfill the items on my list. In addition, as I complete these items on the list, I’ll cross them out, so you can see what I’ve accomplished at a glance. I don’t expect to get these items done overnight. Indeed, I suspect this will be a…process.